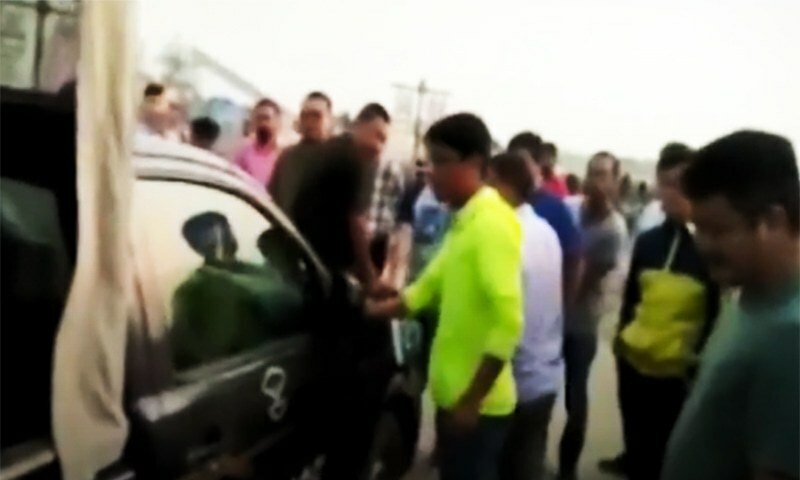 Chinese engineers and other staffers, engaged in the construction of M4 Motorway from Bahawalpur to Faisalabad, attacked policemen deployed for their security after the foreign workers were barred from leaving their camp’s premises without a security squad, DawnNewsTV reported. According to police officials, Chinese engineers and other officials wanted to leave their camp in Khanewal and visit a “redlight” area on Tuesday night. However, they resorted to agitation when denied permission to leave the camp without being accompanied by security officials. Subsequently, the protesting Chinese engineers wrote a letter to Punjab Chief Minister Shahbaz Sharif, claiming that police officials refrained them from discharging their duties and attacked them. They also accused the security in charge of attempting to hit Chinese workers with his vehicle. Police officials, however, rejected the accusations and termed them fictitious and fabricated. Later in the day, Khaewal DPO Rizwan Omer Gondal held a meeting with the protesting Chinese workers following which they agreed to open the blocked roads. Meanwhile, the police officials made it clear before the Chinese engineers that they will not be allowed to leave their camp without security arrangements. It was not the first time when Chinese nationals in Pakistan attacked local police. In 2016, a clash occurred between the police and Chinese workers as the latter insisted on staying at a construction camp at night, but the former opposed the idea due to security reasons.